Home Uncategorized Satisfying our Thai Craving at Pye Boat Noodle! Satisfying our Thai Craving at Pye Boat Noodle! We recently found ourselves craving Thai food, and quickly asked around for some recommendations. 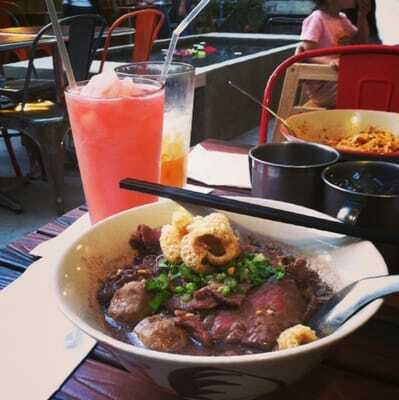 We’ve been hearing a lot about Pye Boat Noodle lately, and decided to check it out. Now, here’s the thing. A lot of the time, Thai food tastes pretty…similar. As in, we can’t really tell the difference between red curry and green curry. We’ve never actually been to Thailand, so we can’t voiuch for the validity of Pye Boat’s flavors, but let’s just say we really enjoyed them. Here at Give Me Astoria, we’re on two ends of the spectrum: half of us love spicy food and douse everything in as much sriracha as possible…and half of us run for the hills at the slightest sign of spice. Pye Boat Noodle did a really great job of meeting both our needs. We started off with the Som Tum Poo, which is a papaya salad, and was recommended to us by our server. For entrees had the classic Pad Thai, becuase that’s kind of the baseline for Thai food. It was really good – and we loved the fact that the toppings came on the side, instead of mixed in. It wouldn’t have bothered us too much, but for people who like to add their own peanuts, sugar and pepper, we’re sure it’s a really welcome change. We also had the Boat Noodles, because if they’re in the name…then we should probably try it. The meat and spice loving half of Give Me Astoria had this dish, and it was everything it could have been. (Though we had to add a little spice to get it perfect…which is far more than the normal person would like). As for drinks, their Thai Iced Tea was spot on, as well as the watermelon juice – which really hit the spot in this heat. We loved the vibe at Pye Boat Noodle. It’s really quaint and rustic, and clearly Asian inspired…but it doesn’t feel forced. There’s a gorgeous outdoor seating, and we opted to sit outside and enjoy the breeze. Also because….the K Pop just wasn’t doing it for us. Honestly, it was a bit intense, and we weren’t crazy about it – so the outdoor seating was a welcome haven. Overall, we had a really good experience at Pye Boat Noodle. The food was beyond delicious – and the best part was that it was extremely affordable. We were able to eat comfortably within a budget. Minus the K Pop, we can’t wait to go back. *Photos from Yelp and Facebook because we’re horrible at taking proper pictures when we’re hungry. Previous articleDiana Limongi: Bringing French to Astoria!